admin May 9, 2018 May 9, 2018 No Comments on Shortcut Keys To Restart Your PC Drivers!! Fixing your PC drivers becomes a necessity when your PC suddenly get locked and nothing responds. The screen turns black and looks like disaster…. But no… The sound beep is coming from speaker, turns you back to life, and a message explains that your display driver stopped responding, but had now recovered. That ability to automatically restart a driver is very useful, but you don’t have to wait for your system to detect an issue. Let us explain the shortcut keys to recover your driver issues that everyone needs to know. To restart your graphics driver at any time, just press Win+Ctrl+Shift+B: the screen flickers, there’s a beep, and everything is back to normal immediately. From what we could tell, this seems to be very safe. It’s just restarting the driver; any custom settings are untouched and everything should work exactly as it did before. There are no guarantees, of course, and if your PC already has issues then it’s hard to say how it’ll respond. Treat this hotkey with a little care — don’t use it while you’ve got unsaved work, don’t try to hammer it 100 times in 10 seconds to see what happens — but otherwise keep the shortcut in mind for emergencies. Other drivers might lock up too, occasionally, and they can be manually restarted with a little help from Device Manager. At its simplest you could find a device in the list, right-click and select Disable, right-click again and select Enable. Be careful, though– disabling something important can break your PC. Otherwise some automatic driver recovery software’s are also available, users can take help of. 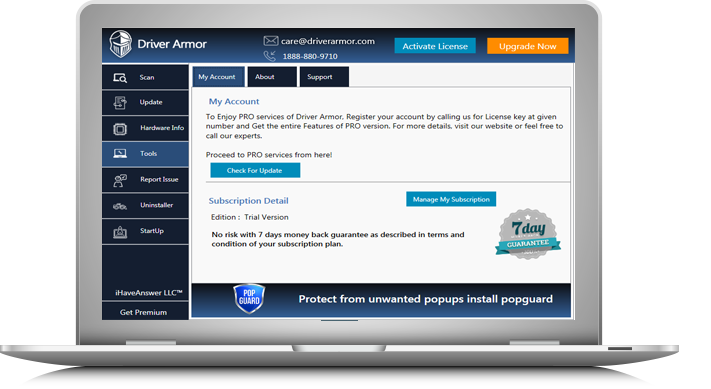 Driver Armor comes with some extra features like Fast system scans, Driver backup & restoration with full customer support, a user can get extreme benefits.